When Oz called Garcinia cambogia “the newest fastest fat buster” I nearly fell out of my chair. Since there’s a huge amount of interest in any weight loss supplement recommended on the Dr. Oz show, we do our best to feature most of them here on UltimateFatBurner.com. Accordingly, we’ve covered more than a handful already (including green coffee extract, raspberry ketones and Satiereal to name a few), so at this point, I really should not be surprised by anything Oz says. And yet, I continue to be. Because Garcinia is not new. And when I heard this..
See, a lot of people hang off every word of Oz’s – they respect him, and they turn to him for answers. The guy has, after all, some pretty impressive medical credentials after all. He knows about science. He knows about clinical studies. He knows about methodological flaws and small sample sizes. He knows about the placebo effect. He knows about conflicts of interest and how they can impact study results. Yes, he knows ALL this stuff, but chooses to ignore it and instead, provide rosy, exaggerated “pictures” of the weight loss supplements he features on his show. Truly, Dr. Oz has done more than drunk the Kool-Aid. He’s guzzled back the entire jug. Well, that’s understandable – Oz is a doctor and a celebrity. But let’s make one thing clear; just because Dr. Oz says it is “so”, doesn’t make it any more “so” than me saying it is not so makes it not so. The measure of Garcinia cambogia’s “effectiveness” can only be gleaned from reviewing the available clinical studies. This review of garconia cambogia will take a closer look at those, so you can make up your mind. 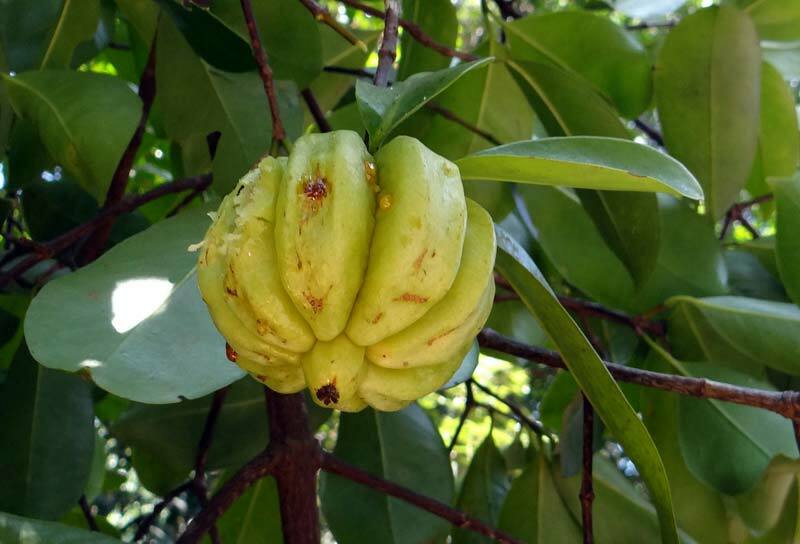 As you probably already know, Garcinia cambogia is a fruit native to India. The ingredient to which the “fat burning” effects are attributed is something called “hydroxycitric acid” (or HCA), which is extracted from the rind, and can inhibit ATP citrate lyase, a key enzyme in the synthesis of fatty acids. Garcinia cambogia, hydroxycitric acid, HCA and Citrimax all refer to the same thing: hydroxycitric acid. On the face of it then, Garcinia cambogia – via its hydroxycitric acid content – may have some use for weight loss. What do the Studies on Garcinia Say? In other words, some studies show Garcinia extracts work to some small extent, but for those that do, methodological flaws and small sample sizes call the reliability of the data into question. Even if you want to interpret this data in the most generous way possible, there’s nothing here to justify Oz’s “newest fastest fat buster” comment. However, we’re not finished with Garcinia yet. A Newer Form May be More Effective! A newer form of HCA, called Super Citrimax, was trialled at the Georgetown University Medical Center in 2004 (you may recall seeing a clip of the study’s lead author, Dr. Preuss, highlighted on the Oz show). This study demonstrated a 5.4% decrease in body weight over the 60 day trial period. For a 150-lbs woman, that equates to 7.8 pounds of weight loss in two months. For a 200-lbs man, 10.8 lbs. The main issue with this study is that completely contradicts Oz’s statement, that Garcinia may be the “magic ingredient that lets you lose weight without diet and exercise”. Because as you can see if you review the study abstract yourself, participants very clearly did both; “participated in a 30 min walking exercise program 5 days/week” and were restricted to a 2,000 calories per day diet. Could you lose 8 pounds in 2 months simply by restricting your calories and exercising? I would say you could… without the aid of Garcinia. And even if it helps, well, at the risk of sounding like a broken record, there’s nothing here to justify any of the statements made by Oz. The other thing Oz’s experts highlighted was Garcinia’s cheap cost. For example, iHerb.com sells the 90 capsule Now brand Super Citrimax for just under $16. To duplicate the dose found helpful in the Georgetown clinical study (2800 mg of standardized extract divided into 3 doses) , you need to take 6 caps per day. So you need two bottles per month. That’s $30. Affordable maybe, but hardly cheap. Bottom line on the Garcinia Review? Initially it was pushed by the supplement retailers as a carb blocker and it did sell well for while, until customers found the promised results didn’t materialize. Then it stopped selling. I’m sure it will sell well now, due to Oz’s recommendations, until once again, the promised results fail to materialize. If in doubt, review the clinical study results. They are what tell the tale. This is an EPIC fail by Dr. Oz. In the period after Oz’s endorsement of Garcinia, I’ve seen a ton of unscrupulous people taking advantage of a desperate audience by selling garcinia products for anywhere from $40-$70. If you still want to experiment with Garcinia after reading this review, you don’t need to spend much. In fact, you can experiment for about $10. P.S. We use iHerb regularly and have no hesitations about recommending them to our visitors. We’re sorry you feel that way. We feel it’s a small trade off in exchange for the high quality, free content that we provide. It takes a lot of work and a lot of time to do the writing and the research for the articles we post, and we feel it’s a small price of which to ask from our visitors. Social signals like the share and “like” buttons help tell both search engines and social media that our content is worthwhile and engaging. You’ll notice that the article is “locked” more than half way through, so you are always free to “not” share it, should you not think it’s worthwhile. I agree with Jo Hanna. I have been coming to this site for more than a decade and to now be forced to share or like just to read is absurd and a big turnoff to a once beloved site. Facebook seems to manage just fine without holding its visitors hostage or forcing them to take some sort of reciprocal action if they want to read a page or a post. If they can do it, so can this little, tiny site. And if not, there are always paid banner ads! I didn’t have to “share” to be able to read the whole article. I’m not sure what Jo Hanna is referring to but I get email notices about articles then click to read more. Anyways, I had already noticed something funny going on with Dr. Oz. I was more familiar with realage.com than with who he actually was & his credentials before he got popular with Oprah. I watched his show a couple of times recently & half the time the information sounded good with basic science to back it up but the other half of the time it felt almost like an advertisement. It scares me how people ooh & aaw over what he says, like it’s golden. I only trust people as far as I can throw them, lol. I didn’t have to “share” either. I just pressed the g+ button and read the whole article. Perhaps she should try again. No ploys here, Jo Hanna. Try again, sweetie. Anyway, I used to record the Dr. Oz show, but when he started advertising his miracle finds for weight loss, I stopped. I saw this show on the Garcinia last year and right away, sought Paul’s research on it and sure enough, it was not an effective product. I wish I had done that on the Sensa product. I got ripped off big time with that one. Nothing compares to diet and exercise. I have since started on the 5:2 diet with my husband and so far I’ve lost 14 lbs. and he’s lost 10 lbs. We eat whatever we want for 5 days and Mondays and Wednesdays, I eat 500 calories and he gets 600 calories. We’ve gotten so used to it, that we look forward to our “fast” days. Thanks for all you do, Paul. Thanks so much for your support, Linda! I’ve lost around 11 poduns in a month with this product by combining with a low carb diet and exercise. I found that this product is excellent at suppressing my appetite when I take it anhour minutes before eating. I always take it with a big glass of water, which I think also helps me feel full. I get full very quickly which is exactly what I wanted from this product.